The StudioConnect really does very little to connect you to your studio so maybe a name change is in order - and halve the price while you're at it. Fairly compact. Can charge iPad. No USB MIDI. No mic press or balanced outputs. Expensive. Accessories are popping up left, right and centre that facilitate musicians to get their music in or out of the 'Pad in a professional manner. Gadget guru Griffin has thrown its hat in the ring with the StudioConnect, a lightweight 'dock' for the iPad with phono outputs, mono 1⁄4" and stereo 3.5mm inputs, MIDI DIN I/O and a 3.5mm headphone jack round front. "With so many other docks supporting USB MIDI not including it is not just an oversight, it's a deal breaker"
The unit feels a bit plastic for the price and the dock is really just a holder for your pad with the 30-pin connection happening on a separate cable. Once you're in, the big knob takes care of the iPad's volume while the slider on the side looks after input levels. We can't help but feel 'StudioConnect' is the wrong name for this product. There's no USB MIDI, so you'll need to use DIN cables, a connection which many portable keyboards and controllers don't support. 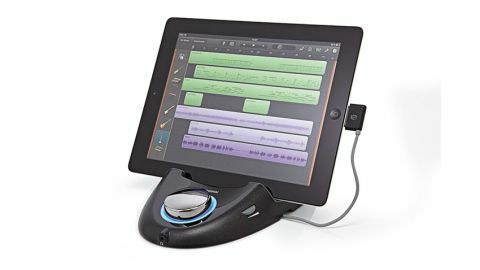 With so many other similarly-priced iPad music-making docks supporting USB MIDI this is not just an oversight, it's a deal breaker. Without any mic pres or balanced outputs, you're very limited to what you can record.